Only her second Fashion Week season and breakout model Gigi Hadid had one outstanding month. She kicked off her season in New York on the football field for Tommy Hilfiger and closed out the Big Apple opening the show for Anna Sui. In Milan she made her Fashion Week debut channeling Marilyn Monroe while opening the show for Max Mara, while perfectly fitting with the all-star supermodel cast for Emilio Pucci. Then that "Grande momento" moment happened when she received her official Dolce and Gabbana crown, and how can we not forget that finale walking side by side with Karlie Kloss. 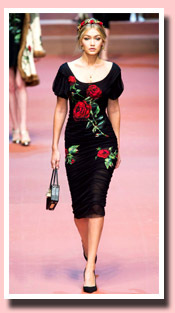 The bombshell then landed on the moon in Paris walking for H&M while closing out her season for Sonia Rykiel. In all she walked 12 shows which may not seam that incredible when some girls walk more than 40, but we always say It's not how many shows you walk in a season, it's about the shows you make memorable, and the angelic Gigi Hadid certainly did make every show memorable.